With this hands free umbrella invention, it’s time now to use your hands even in hand and you need not hold the umbrella. From now on you can use both hands easily in the rain to work in the rain, even playing the rocks, play on mobile or you can simply do whatever you like. 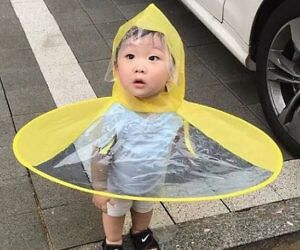 It is perfect for children as they won’t get tired up with holding the umbrella. Senior citizens can also be relaxed and hold their walking stick with them even in rain. This hands free umbrella is a lightweight as well as it can be easily folded. Buy it now!